불갑사 대웅전에 모셔져 있는 나무로 만든 삼세불좌상으로, 중앙의 석가모니불을 중심하여 왼쪽에는 약사불이 배치되고 오른쪽에는 아미타불이 자리하고 있다. 석가모니불은 주존불로서 삼불 가운데 가장 크고 건장한 신체에 무릎이 넓어 안정되어 보인다. 육계의 구분이 명확하지 않은 머리에는 정상계주와 중앙계주를 큼직하게 묘사하였으며 네모꼴의 얼굴에는 잔잔한 미소가 엿보인다. 두 귀는 길어서 어깨까지 늘어졌고, 약간 굵어진 목에는 세 개의 주름인 삼도(三道)가 뚜렷하다. 옷은 양어깨를 모두 덮고 있는 형식으로 오른팔을 드러냈으며, 옷주름은 두 다리 위로 자연스럽게 흘러내리고 있다. 수인은 항마촉지인(降魔觸地印)을 하고 있는데, 양손 모두 마치 실제 인물의 손처럼 표현하여 사실성이 돋보인다. 약사불과 아미타불 또한 불명확한 육계, 팽창된 얼굴, 분명한 이목구비, 부피감 있고 편안한 자세, 사실적으로 표현된 양 손, 자연스럽게 흘러내린 옷주름 등의 세부 표현에서 본존인 석가모니불과 공통적인 특징을 보인다. 다만, 석가모니불에 비하여 크기가 다소 작아지고 양어깨를 모두 덮은 옷에 오른팔을 드러내지 않고 아미타인(阿彌陀印)의 손 모양을 하고 있는 것이 다를 뿐이다. 불상 안에서 발견된 불상 조성기에 의하여 1635년 무염(無染)스님을 비롯한 승일·도우·성수 등 10인의 화승들에 의해 조성되었음을 알 수 있다. 이 불상은 지금까지 전해지고 있는 무염비구의 작품들 가운데 가장 초기의 것으로, 전라도·충청도·강원도지역을 거쳐 폭 넓게 활약하던 무염일파의 작품과 경향을 파악하는데 있어서 기준이 되는 작품으로 평가된다. 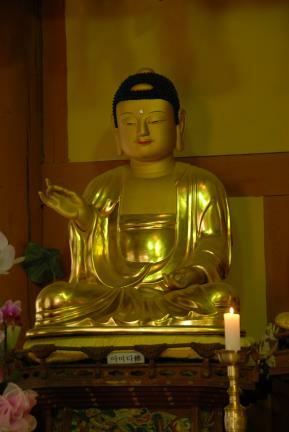 The image of Shakyamuni Buddha looks stable, showing a body larger than the other two. Large beads are portrayed on the topknot and near the forehead. The square face carries a gentle smile, with the ears extending down to the shoulders. The slightly thick neck shows three clear-cut lines. 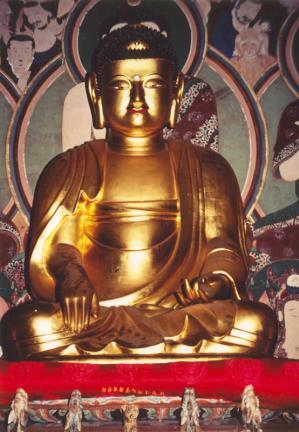 The robe is hung on both shoulders, with the right arm revealed under the robe. The robe wrinkles flow naturally down to the legs. 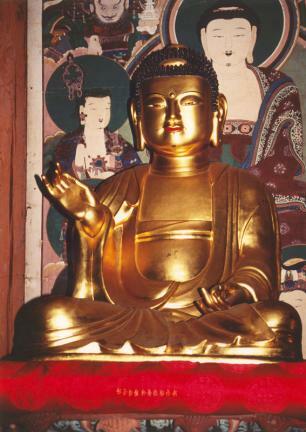 The fingers of one hand point to the bottom, with the other hand placed on the lap, palm facing up (gesture of subjugating demons). The two hands are portrayed realistically. 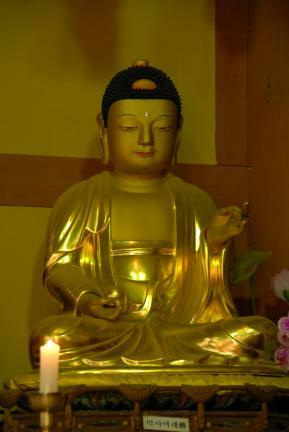 The Medicine Buddha and Amitabha Buddha share the following features with Shakyamuni Buddha seated at the center: unclear usnisa (a protuberance symbolizing supreme wisdom); overblown face; clear-cut facial features; comfortable stance; realistically expressed hands; robe wrinkles naturally flowing down, etc. 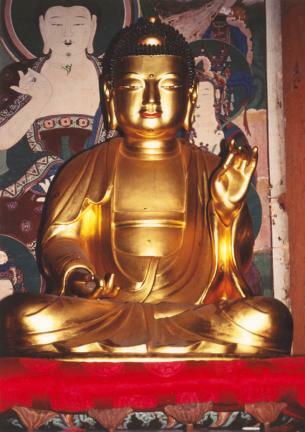 The only differences between the three are the smaller size of the Medicine Buddha and Amitabha Buddha showing the Amida hand sign and wearing of a robe hung on both shoulders without revealing the right arm. 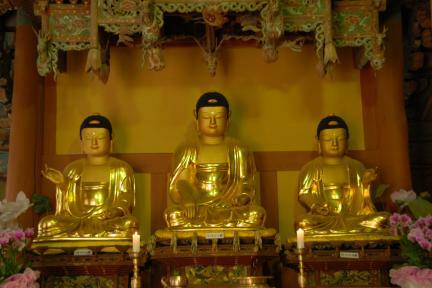 The relevant records found from the inside of the statues say that they were made by ten Buddhist sculptors, including Monk Muyeom, in 1635. 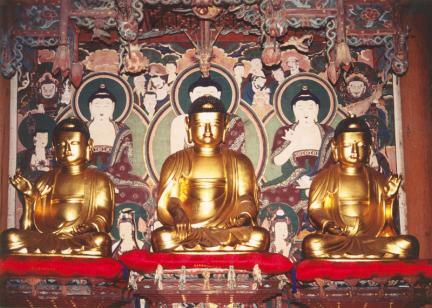 This piece is the oldest one of the existing works made by Monk Muyeom. 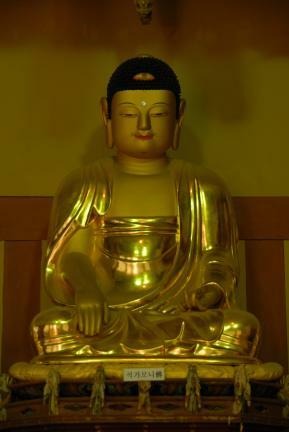 According to experts, this one is a benchmark work that helps them get a grasp of the trend of works of said monk and his followers, who carried out activities in Jeolla-do, Chungcheong-do, and Gangwon-do.